It was approved under delegation in September. I presume that if it did not meet the overshadowing requirements then it would have gone to a Council meeting for a decision. All I know is that it was going to have a big display screen on the corner like Emporis. Almost anything would be better than the building on the site at the moment and the horrid blank walls of the adjoining buildings. Not crazy about this. Podium is a bit of a shocker and the current building could be effectively retained with a scrub up. ^^The current building??? You're referring to the nondescript shitbox HJ's. lol Are you serious??? This will appear like a baby compared to what's going up next door. We end up with the boring version. An application has been submitted to demolish Deakin House next door and build another student accommodation tower. Great! Just need to replace the little old buildings next to deakin house, then with the huge elenburg Fraser tower, the whole north side would be a nice sun-blocking wall (because of course the Min gaps is only 10m these days). Display suite is open for this one, looks like Scape Living student accommodation. Not 100% sure but I think the design has changed slightly, may be wrong though. Construction set to be complete by 2017, so should begin sometime this year i'd say. A UK-based developer and a pension fund asset manager in the Netherlands are set to invest in Australian student housing, initially amounting to $220m. APG has sealed an agreement with Scape Student Living to develop and manage direct-let student dwellings across Sydney, Melbourne, Brisbane, Canberra and Adelaide, in order to replicate London’s luxury student accommodation model. This may be the country’s first type of student housing. any links to a project website? It's either in the building or the building next door. Walked past again today but was closed. Haven't been able to find any online information as of yet, maybe they're just about to launch? They've got a tv screen with renders and stuff flashing out the front though. Totally missed this thread and development until now. I love the podium and it's craziness !! That corner needs something big to complement Melbourne Central and the Big Green RMIT mouth across the road and yet remain respectful to the State Library .. it's a major intersection after all. I went past the display suite yesterday and I actually don't think it is this site that is being promoted I believe it is the adjoining site 393 Swanston Street. The renders on the building definitely showed that it was the site on the corner with Little La Trobe Street not La Trobe street. Ah, that would make sense why the building looked different then. Why can't we get the digital screen? Even without it the podium is good but the screen really makes that area near MC pop. 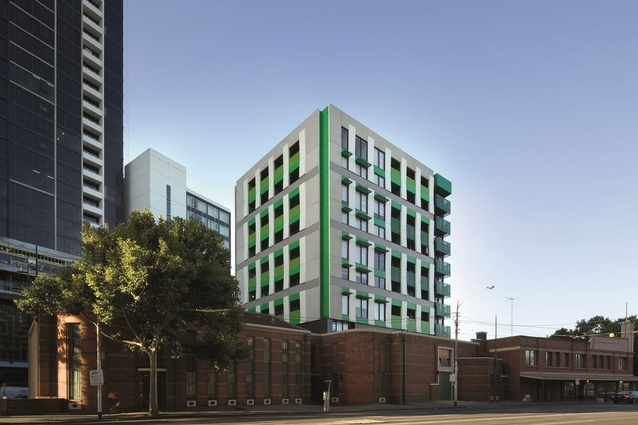 "London-based student living group Scape is set to build a 1500-bed complex across the road from RMIT University in Melbourne's Swanston Street. The accommodation provider bills itself as a "campus within a campus" – it builds, owns and leases to students studio bedrooms in towers that also include gyms, lounge, gaming and lecture rooms, as well as restaurants and bars. The student rooms come furnished with desks, ensuites, double beds and a kitchenette. Scape paid $35 million this week to buy two office buildings between La Trobe and Little La Trobe streets in a deal negotiated by Savills Australia's Nick Peden and Clinton Baxter. Mr Baxter said the site got a record CBD land rate of $37,154 a square metre. The two development sites, which had permits for 54 and 39 level towers, sit behind another Scape property at 393 Swanston Street which has a permit for 750 studios in a 45 level tower. Scape has a 2500-bed operation in Britain backed by the $800 billion Dutch pension fund APG. The firm's Australian managing director Stephen Gaitanos said it was aiming to own and operate 10,000 student beds in Sydney, Melbourne and Brisbane. "We picked Melbourne and this particular part of Melbourne first because of its proximity to RMIT, Melbourne Central retail mall and train station, and the State Library," he said." BUT Scape already had a permit for something at 393 Swanston (permit issued late last year), so either the Age is way behind, or they have just bought the corner site as well, though thats a hungry jacks, not an office building, and neither is 'behind' 393 Swanston (though there is alittle building there across a lane, but thats owned by RMIT) - anyway, if this means that they now own both already permitted development sites, maybe the whole thing will turn into one big(ish) development site ? That might be better, cos they could have slightly bigger setbacks from a more ordered podium - it was all looking a bit madly confusing with the two towers with completely different podium approaches (I love how the image in the article shows the original Scape tower, and the corner one only as a vague outline).